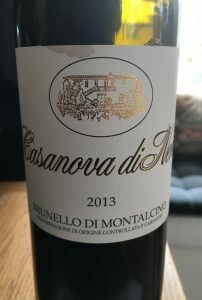 2013 Casanova di Neri, Brunello di Montalcino DOCG, Tuscany, Italy. The classic di Neri white label Brunello 2013 is exactly what I had been led to believe the vintage was, ripe and structured, easy to love now, but with serious age worthy potential that makes this vintage something special, especially for Americans that like to drink the wines in their youth. This is a rich and full bodied Brunello, showing a pretty dark garnet hue, that flows across the palate with finessed grace, but with an underlying power and a velvet grip showing ripe fruit, mixed spices, minty herbs and light cedar notes adding focused Sangiovese (Grosso) details and subtle acidity. Layers of blackberry, plum and pouched cherries lead the fruit in the mouth and while the aromatics are still evolving there is a sensation of dried flowers and incense beneath the youthful personality which bodes well for it’s future and it’s inner beauty. With air the sweetness of fruit gives way to savory tones with the addition of pipe tobacco, a hint of balsamic or hoisin, anise and minty herbs, but overall the Casanova di Neri Brunello stays generous, without too much wood, and mouth filling with purity of place and grape, it’s very lovely and impressive stuff. 2013 is a vintage that has serious, structure and stuff, but can be enjoyed in it’s youth, I can imagine a 20 year drinking window here.